Ready for a shock? The average US household guzzles down 320 gallons of water a day—that’s about nine full bath tubs’ worth of liquid! And about 30 percent of that gets dumped out straight on the lawn. 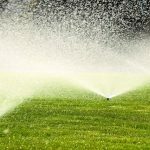 Conventional water sprinkler are so inefficient that about half of all the water they use is totally wasted. No matter how hardy the plant, most species need a little supplemental watering every once and awhile, especially during the driest parts of the year. Sprinkler? Certain techniques definitely are more water-efficient than others, however. For instance, never water your garden during the hottest part of the day. Not only will the water evaporate more quickly, meaning your plants don’t get the good soak they deserve, if the sunlight is very intense, the reflection from the water droplets could damage the leaves.